يقع فندق Saltwater Luxury Apartments، المصمم ليناسب كل الضيوف سواء كانوا من رجال الأعمال أو السياح، في مكان ممتاز في أحد أكثر المناطق تفضيلاً في نورث بورت دوجلاس. يقع مركز المدينة المثير على بعد 0.1 Km فقط. سوف يعشق النزلاء موقع هذا الفندق، فهو قريب من أهم المعالم السياحية في المدينة كمثل Des Spencer Art, Coffee Works, شارع ماكروسان . كما يقدم Saltwater Luxury Apartments الكثير من الخدمات لإغناء رحلتك في بورت دوجلاس. لضمان راحة ضيوفه، يقدم الفندق الخدمات التالية: تخزين الأمتعة, واي فاي في المناطق العامة, صف السيارات, التوصيل من وإلى المطار, رعاية أطفال . في الفندق غرف نوم يتجاوز عددها 14، كلها مجهزة بعناية وجمال وبعضها مزود بـ تلفزيون بشاشة مسطحة, مرحاض إضافي, مواد تنظيف, رف للملابس, قهوة فورية مجانية. يقدم الفندق العديد من الفرص للاستجمام كمثل مسار جولف - ضمن 3 كم, حمام سباحة خارجي, سبا, تدليك, حديقة. إن Saltwater Luxury Apartments هو خيارك لخدمة الفنادق الراقية في بورت دوجلاس. ساعات عمل مكتب الاستقبال من الساعة 9 صباحًا حتى الساعة 6 مساءً (من الاثنين إلى الجمعة)؛ الساعة 4 عصرًا (السبت)؛ الساعة 1 ظهرًا (الأحد). إذا كنت تتوقع الوصول خارج ساعات عمل مكتب الاستقبال، يُرجى الاتصال بالعقار مباشرة قبل 24 ساعة على الأقل من وصولك للحصول على تعليمات تسجيل الوصول الخاصة بك. تتوفر مهود الأطفال مقابل تكلفة إضافية بقيمة 10 دولار أسترالي في الليلة. يرجى الاتصال بالعقار للحجز المسبق. Stayed in a 2 bedroom apartment and it had everything we needed. They were very quiet with no noise heard from other apartments. The guys were very helpful and friendly. Location was fabulous being right in the centre of town. The pool was lovely and warm and very clean. There are stairs to go up and down from so anyone with mobility troubles may find it difficult. Thoroughly enjoyed our stay and will go back next visit. Spent 3 nights here with family visiting from Scotland. The location was fantastic, close to all amenities. Apartments well equipped. Stairs could be a problem for some guests as there are a lot. Felt the charge for internet was too expensive. Also internet unavailable when we stayed. Central to everything we needed yet quiet and peaceful. Saltwater apartments are in a fantastic location. The managers are very friendly and helpful. Very clean apartments, the pool is heated and has sun all day. Great apartments for a family holiday. Right on the peak of Macrossan St but rucked back from the street these apartments are in an amazing location. Staff are extremely friendly and helpful. Our apartment at the beach end of the complex got quite a bit of truck noise at 0630 each morning but otherwise the appartment was quiet. The master bedroom is open to the living space with a "window" which isn't optimal for sleeping in with early rising kids! Overall a lovely appartment. We stayed in a 3 bedroom apartment which was perfect for our group of three sisters. The location was excellent - right in the main road in the town, while being set back so not too noisy (unless you count the riotous racket of the birds every morning and early evening - gorgeous to hear and see). The beach is a quick walk, as are all of the town's bars and restaurants. There's a supermarket right across the road and an extremely nice shoe shop right downstairs. We enjoyed the pool and we're lucky enough to have had it to ourselves on all but one occasion. The weather was perfect at this time of year - sitting in the mid 20s, so it wasn't too hot nor too cold. 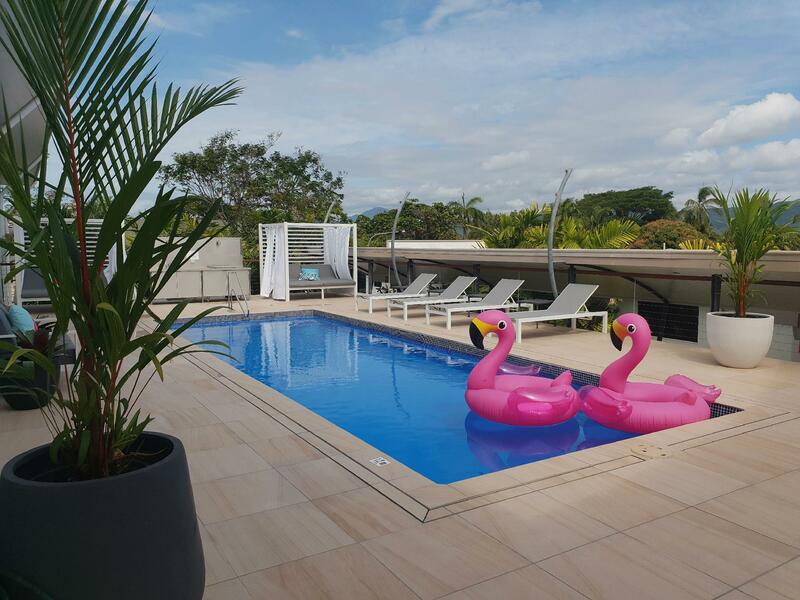 We thoroughly enjoyed our week in Port Douglas and lived the apartment for its comfort, cleanliness and location. I have already spoken to my husband about visiting with our children. These apartments were heaven. We had a 2 BR unit and it was HUGE! It's the biggest vacation apartment we've ever rented, and we've stayed in a fair number. Everything is top of the line--fridge, microwave, stoves, TV and furniture. Loved it! Best of all is the location. We crossed the street for groceries, pharmacy and Target Country. So nice! There was also a small fish pond at the shopping area that the kids always played with. We stayed 5 nights here and had a blast. We walked to our 2 days of Barrier Reef trips meeting point. We also did our Kuranda Tour from here, beaches, and the Nature Center at the edge of town. Fantastic location and well appointed apartment, not sure how you can call it a Penthouse. Biggest disappointment was the swimming pool was out of action for our 4 nights but we did get a refund for 1 night. The stairs can be a pain if you are on level 2 which we were. Overall feature is the location is just brilliant. There is no elevator, so one needs to negotiate some quite lengthy steps to access the apartments. No problem for some, not so good for others. That said, the car parking is great with a secured basement carpark for guests. Couldn't be a better location, easy walk to the beach and in the middle of all the good shops and restaurants. Apartments were spacious enough, and pool was adequate (but could use a few more deck chairs) the two owners who sat at reception were amazing! Super friendly and accommodating! Although when we ran into the cleaner she was quite rude, arriving to clean our room half an hour early and was visibly annoyed when we weren't awake. Our stay at Saltwater was superb as it is centrally located with a Coles supermarket and lots of good restaurants nearby. Our hosts were great and helped us prepay and booked all of our local tours. Couldn't have been any better, well maybe sunshine would have helped ! John and Carolyne were excellent property managers who gave helpful suggestions regarding diving tours and dining in the area. The accommodations were gorgeous and right in the central area for walking to restaurants and shopping etc.....marina right down the street for The Great Barrier Reef trips.